Camping gear and supplies Outfitter. They also carry Hunting Gear, Fishing Gear, Hiking Gear and other Outdoor Gear and Outdoor Supplies. 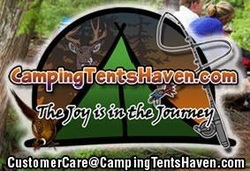 Camping Tents Haven, your camping, fishing, hunting, hiking, and outdoor outfitter now has a Facebook Page.